Montreal Poster print. One of the best ways to promote a business, services, events and products is using the poster.you will be visible more than more with this great method of communication. the poster is often a single side paper in different size. 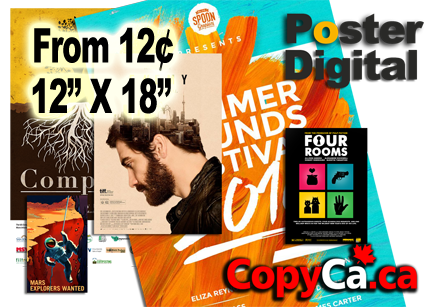 you search effective tools for marketing, we are one of the best in Montreal to print poster. Thanks of our new machines you could have your posters very fast on the same day or in next business day and very cheap in Montreal, Quebec and everywhere in Canada. We granite our quality and delay of the production. For any quantity, you could submit your order.